Wonder of wonder, miracle of miracles! Our one lone chicken, a Red Star who I call Marcia B., laid our first egg today! As excited as Caleb and I were to find the egg in the nest box this evening, it was also a little bittersweet, knowing that the 3 chickens that were killed last week could have been laying this week. For all of you who complain about the rising prices of eggs at the grocery store, you’ve got nothing on us. This is quite possibly the most expensive egg in the history of the United States. After the $300 invested in the making of the coop, $32 spent on the chickens themselves, $16 spent on layer ration (chicken food), $14 for grit and oyster shells (chicken calcium), $24 for scratch grains (chicken “treats”), $20 for supplies to reinforce the coop to try to keep out the “beastie” that was attacking them, and $55 for the HAVAHART to trap the “beastie”, that officially makes this a $461 egg. Maybe we could sell it on eBay. My question is: Who gets to eat the $461 egg? I know it’s not Lucy since she’s allergic. Don’t worry. 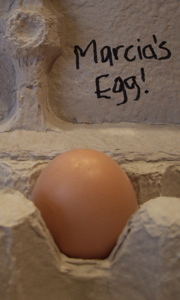 As soon as more eggs are laid, you can amortize the capital investment over the whole product line. The next egg will reduce the cost per egg down to $230.50. This, of course, assumes that you don’t incurr any additional period costs before that time…. In the wake of chickencoop tragedy, it’s a beacon of hope to see the chicken legacy live on.